The Jaguar E-type redefined people’s expectations of what could be expected from a relatively affordable sports car – race-car handling, and a potential 150mph. It rightly defined a generation, and then went on to become the de facto classic car. Ian Nicholls tells its story. Although automotive styling is subjective, the one vehicle that seems to top more opinion polls naming the most beautiful car in the world, the Jaguar E-type. Styled mainly by aerodynamicist Malcolm Sayer, with significant input by Sir William Lyons, the car caused a sensation when it was unveiled in 1961. For many, it’s also gone on to become the one car that consistently challenges the Mini as the decade’s automotive icon. 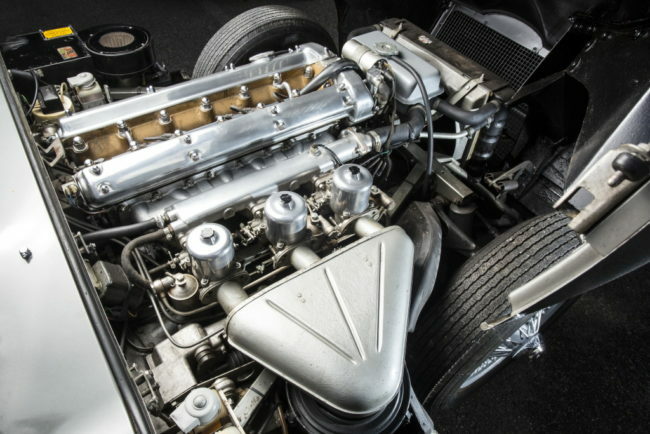 The heart of the E-type was the DOHC inline-six cylinder XK engine, originally launched in the Jaguar XK120 back in 1948. When it first appeared in 1948, the XK engine developed 160bhp, and went a long way to helping the XK120 along to become the world’s fastest series production car. It was a special engine, though – and went on to lead a very long life – a testament to its design team: Claude Bailly, William Heynes and Walter Hassan. Its development potential soon became apparent, and with each successive new Jaguar launch, it became just that little bit more powerful: while the XK120 became the XK140 in 1954, and then the XK150 of 1957, its engine was stretched to keep each slightly heavier new variation as quick as its predecessor. In 1960, once again, the XK sports car line became a force to be reckoned with, with the arrival of the new bored-out 3.8 litre XK version, which pumped out 220bhp (SAE) and 265bhp (SAE) depending on which version you went for. It was a good starting point for the next generation of sports car – because if nothing else, the XK140 and XK150 had been criticised by owners and enthusiasts for their tendency to become fatter and heavier; thus diluting the XK line. 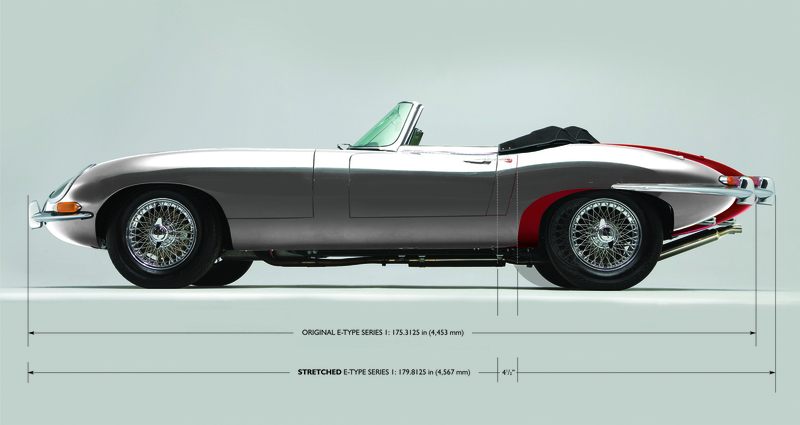 The team that would create the E-type needed little encouragement. The firm’s technical director, William Heynes, had been at Browns Lane since 1935, and ended up leading the project; the body was styled by a new recruit to Jaguar, Malcolm Sayer, and here’s where the company took a real leap forward. Sayer was a modest man, though, despite his brilliant academic performance: born in Cromer, Norfolk in May 1916, he was educated in Great Yarmouth, and then in 1933 he gained a scholarship into Loughborough College, where he studied in the Automobile Department. He left Loughborough in 1938 and joined the Bristol Aeroplane Company, where he stayed for 10 years. Following a couple of years in Iraq, he returned to the UK, taking his post at Jaguar Cars in September 1950. The greatness soon followed: the work put into the C-type paid off, as the car won the prestigious Le Mans 24 hour race in both 1951 and 1953. In 1953, William Heynes designed the one-off XKC 054/XP11 to investigate monocoque construction. 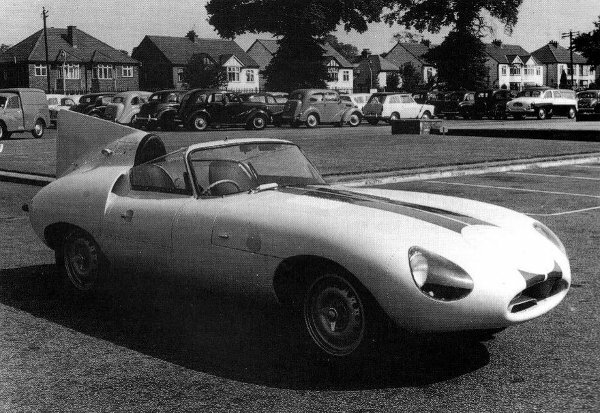 For this car Malcolm Sayer designed a sleeker lower slung body which pointed the way to the E-type. However Jaguar decided an all new car was needed for competition, and created the D-type racer. Again the work paid off as Jaguar won Le Mans in 1955, 1956 and 1957, on the last two occasions, it was the privateer team, Ecurie Ecosse, that triumphed. Under Heynes, work proper commenced on the E-type in December 1956. 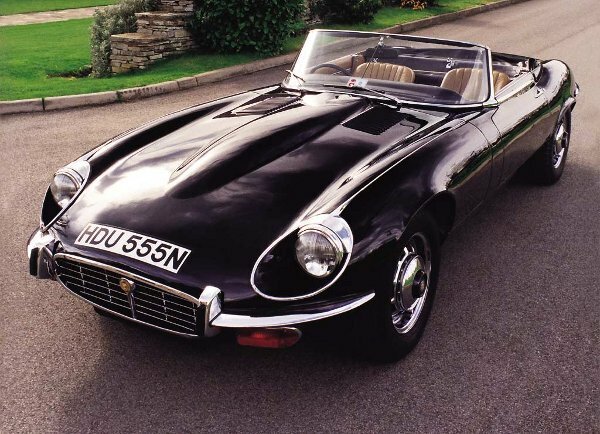 The first prototype was completed in May 1957, and had the official title of E-type 1 Aluminium, or E1A. The E1A was smaller than the production E-type, at 14ft 2in in length, but larger than the D-type. Its construction was largely derived from the D-type, and featured a central monocoque tub. However, where it differed from the D-type, was in its use of a new independent rear suspension system. The E1A was powered by the short-block 2.4-litre XK engine, that had been developed for the Jaguar Mk1, that had been launched in 1955. The E1A was extensively tested by Jaguar’s team of drivers, but in May 1958, Heynes decided to lend E1A to the editor of The Motor magazine, Christopher Jennings, for an independent appraisal. Jennings was impressed by the car’s ability to cover distances rapidly, even with just 120bhp. By July 1959, Jaguar had a third E-type prototype on the road. In 1960, the public had their first view of the style of the next Jaguar sports car when the E2A sports-racer was unveiled. E2A was not an E-type prototype as such; it was based on the D-type, but shared the future E-type’s wheelbase, and was intended to compete in the 1960 Le Mans 24 Hour, where it was entered by American Jaguar enthusiast and distributor, Briggs Cunningham. E2A retired from the event. Jaguar was planned to unveil the E-type at the 1961 Geneva Motor Show. Prior to this, the company loaned the two major UK weekly motoring magazines, The Autocar and The Motor a car to test. These road tests would go on to prove pivotal in marketing the E-type, but a press embargo was in force until the actual unveiling of the new sports car. 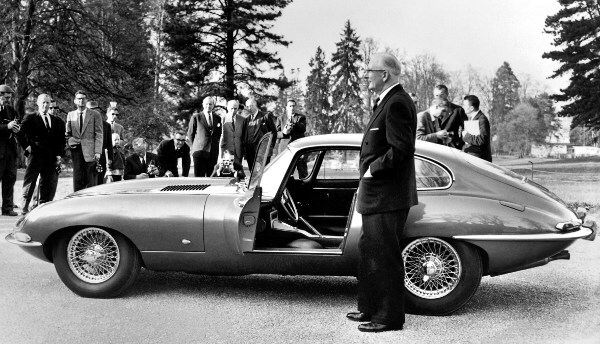 Jaguar already had one car on the company’s stand in Geneva, but it was decided that another E-type was required for Sir William Lyons to show to the media. At around 7pm on Tuesday 14 March 1961, Jaguar’s test driver, Norman Dewis, left Browns Lane, Coventry in E-type 77 RW. He drove virtually flat out through the night, arriving in Geneva, where he drove to the local Jaguar distributor for a 20-minute wash and polish, before heading to the Parc des Eaux Vives for the public unveiling by Sir William Lyons. Surrounded by up to 200 members of the press, 9600HP caused a sensation, and so did the price. At £2097 for the roadster and £2196 for the FHC, it was condemnably cheaper than similar performing cars from Ferrari, Aston Martin and Chevrolet, and was on a par with much slower cars from Porsche and AC. In fact, the E-types was initially sold at a cheaper price than the outgoing XK150. So what was the technical specification of this sensational new Jaguar sports car? The powertrain, which was carried over from the XK150S, was a 3781 cc XK engine mated to a four-speed Moss transmission, without overdrive. Jaguar claimed the E-type engine produced 265bhp (SAE) at 5500 rpm, but this was – to say the least – an exaggeration. The cast iron cylinder block was actually manufactured by Leyland Motors in Lancashire, a task it had performed since 1948, predating its involvement in the management of Jaguar. The aluminium cylinder head came from two sources, West Yorkshire Foundries of York and William Mills of Wednesbury, Staffordshire. The XK engine was fed by triple 2in SU HD8 SU carburettors. The body employed a central monocoque made of steel, a year before the monocoque chassis made its appearance in Formula One racing. The Bob Knight-designed independent rear suspension, and the careful use of rubber, helped suppress noise and vibration. Initially, the car was available in two forms, the roadster – styled by Malcolm Sayer – and the fixed head coupe (FHC), featuring an opening rear hatchback, which also had some input from Sir William Lyons and Bob Blake. The E-type was the only Jaguar car produced during Lyons’ active involvement in the running of the company, not wholly styled by the boss himself. So far the looks and price of the E-type had set pulses racing, but later in March 1961, came the publication of the road tests. The Motor magazine tested 77 RW, a roadster, and the second E-type to be built by the production department. This car could reach 60mph in 7.1 seconds and attain a maximum speed of 149mph. The Motor men assigned to the task were John Anstice Brown and Charles Bulmer, who would go on to become the magazine’s editor. An indication that perhaps the results attained by the Motor men were not typical of the standard production cars was the decision to equip the test car, 77 RW, with Dunlop R5 racing tyres. Certainly, Charles Bulmer later felt that 77 RW had a more powerful engine than standard cars. 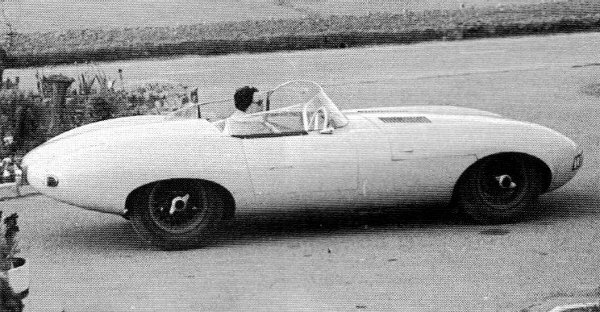 The Autocar tested 9600HP, which was in fact the seventh E-type prototype, the second FHC. To evaluate the car’s performance the magazine used two journalists, one with an interesting past and one with an interesting future: Maurice A Smith DFC was concurrently both editor of The Autocar and Flight. During the WW2, he had completed a tour of operations with 619 squadron, RAF Bomber Command before becoming one of Five Group’s master bombers. It was in this role that he led the first wave of bombers on the controversial Dresden raid of February 1945. His partner on the test was Peter Riviere, who later quit motoring journalism to enter the world of academia, and became a distinguished Professor of Anthropology. The Autocar team, again using Dunlop R5 racing tyres, managed to achieve 150.4mph and a 0-60mph time of 6.9 seconds. The all important 150mph barrier had been breached, and Jaguar Cars marketing machine exploited it. E-type 9600HP: proof the early test cars were tweaked? When 9600HP was restored by its current owner, Jaguar historian Philip Porter, the engine was found to be a run in XK150S unit with a gas flowed cylinder head carefully matched to the inlet and exhaust manifolds – possibly worth an extra 20-25bhp. Maurice Smith later owned a 3.8 litre E-type roadster, and claimed he never got more than 137mph out of it. There is strong evidence that motoring journalists were provided with either carefully blueprinted or tweaked engines in order to attain headline grabbing results in order to create the myth of the 150mph Jaguar E-type. 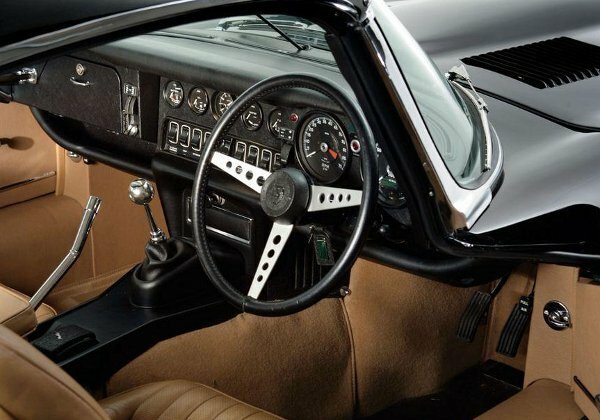 The main criticisms of the E-type were reserved for the seating, the high oil consumption, lack of space, poor braking and the ageing Moss gearbox, which lacked synchromesh on first gear. The E-type was launched at a time when the UK motor industry was coming out recession and bedevilled by unofficial strikes, with BMC particularly afflicted. The new Jaguar was an instant hit, and the company hoped to ramp up production to 150 per week by the Autumn of 1961. 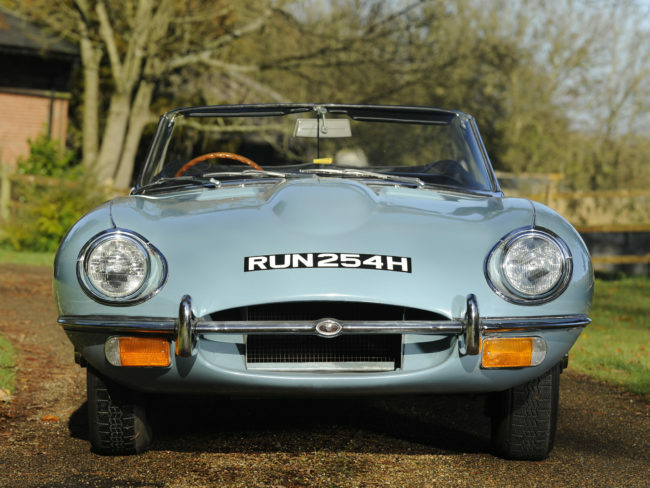 However disputes at Smiths industries and SU Carburettors, suppliers to the Coventry company, restricted production to 2160 E-types in 1961. In fact by August 1961 only 383 cars had been built. In October 1961, Jaguar took over Guy Motors and announced the big MkX saloon, which used the same tune XK engine and transmission as the E-type. In early 1962, a series of internal industrial disputes again paralysed production after Jaguar had won a large American order for its cars, and the disruption continued on and off for the rest of the year. Jaguar managed to ramp up production to 150 cars per week in March 1962. Despite the industrial disputes, Jaguar produced 6266 E-types in 1962. If the E-type looked futuristic, British car manufacturing industrial relations seemed positively archaic in comparison. Most people tend to associate the Jaguar E-type with the so-called ‘swinging-’60s’, but the decade didn’t start swinging until 1963, when the year’s hottest new show business act, a Liverpool beat combo by the name of the Beatles, conquered Britain and swept away a whole generation of sub-Presley lookalikes and soundalikes. The Beatles’ first album, ‘Please Please Me‘ was released in March 1963, the same month that Jaguar took over Coventry-Climax, the fork lift truck manufacturer, which also happened to make racing engines as a sideline. The takeover of Coventry Climax also brought a return to the Jaguar fold of Walter Hassan, one of the XK engine’s original design team. Another major event occurred at the end of March 1963 – with the publication of the Beeching Report, which called for the closure of thousands of miles of railway branch lines. Whatever one’s view of Dr Beeching’s report from the traffic congested viewpoint of nearly 50 years later, at the time, rail travel was seen as a relic from the Victorian era. The public aspired towards car ownership, and as the same public were also voters, any politician who was not prepared to satisfy their aspirations risked political suicide. In Britain, a large scale motorway building programme was already underway and similar programmes were being undertaken across the western world. This was the brash new world of the 1960s, in which new technology would forge a bright future where the sun would always shine, and the E-type became one of the symbols of this utopia. In an era when Britain’s best selling cars, the BMC 1100 and Ford Cortina, struggled to exceed 70mph, the 150mph E-type ate up the miles on Britain’s new motorway system. In April 1963, Autocar tested the latest revised E-type FHC, and this time reached 152.7 mph with a 0-60mph time of 7.2 seconds. After the initial rush for the car in 1961/1962, E-type production for 1963 was down to 4065. The following February, the technical editor of The Autocar magazine since 1955, Harry Mundy, joined Jaguar. Before joining the magazine, Mundy had worked for ERA, BRM and Coventry-Climax, and later designed the twin-cam engine used by the Lotus Cortina. This was also the month the Beatles conquered the USA and spearheaded the British invasion of the American music charts. When the E-type was launched, priority was given to 50 motor racing personalities, so that the car would be seen around the motor racing paddocks. Now, with the success of British pop music abroad, the Jaguar E-type was seen in the hands of the young movers and shakers of the 1960s, giving the car the all important youthful image. George Harrison and Dave Clark were both E-type owners. The E-type gained a revised electrical system and improved seating. So how did the revised car perform? The Motor magazine tested ARW 732B, a 4.2-litre FHC for its issue of 31 October 1964. It managed to attain 150mph and a 0-60 mph time of 7.0 seconds, with more refinement, but that was not the whole story. According to David Benson, then on the staff of Motor, the testers could not get more than 148mph out of ARW 732B, so Jaguar insisted that the car was returned to them for some fettling, which duly done then provided the magic 150 figure. The Autocar was not able to lay its hands on a test car until May 1965, when it tested another FHC, AWK 349B. Using Dunlop R6 racing tyres, it managed 153mph and a 0-60mph time of 7.6 seconds. Total Jaguar E-type production for 1964 was 3960 cars. On New Year’s day 1965, it was announced that Jaguar were taking over the Henry Meadows diesel manufacturer whose plant was adjacent to the recently purchased Guy Motors facility. Then in February, Jaguar subsidiary Coventry Climax announced it would be pulling out of motor racing at the end of the year. This freed up its engineers to work on future road car engines for Jaguar. In March 1965 Motor Sport correspondent Denis Jenkinson took deliver of a Carmen red FHC, FPL 660C, a 4.2-litre E-type. Jenks’s job as a motor racing journalist required him to travel long distances all over Europe, often as far as Sicily, which meant he required a reliable and refined long distance car to replace his then-current mode of transport, a Porsche 356. In 1982, he explained why he initially rejected the E-type, having borrowed a car in the south of France in 1962. He agreed the performance was phenomenal but, ‘…Compared with the Porsche I was running at the time the seats felt awful, with to little support to the back, negligible sideways support and no support at all under the knees. I could not imagine sitting in the driving seat for 12-hours on end, as I was in the habit of doing in my travels around Europe. ‘I found all day at 105mph adequate for my needs.’ One interesting point is that Jenks” cruised FPL 660C at 105mph, which was higher than the 102 mph maximum speed of his previous car, the Porsche 356. Later that year Denis Jenkinson indulged in further high speed continental motoring. ‘During this trip I had frequent occasion to use the full potential of the E-type’s 265bhp (SAE), which in reality is an honest 180bhp. I often pulled 5000rpm in top gear (about 132mph) reaching an absolute terminal of 143mph on the long Autostrada straight past Montecassino, south of Naples. Not unnaturally, one frequently became embroiled in private dices with Ferraris and other fast cars, and on one occasion I ran in company with a 250GT Ferrari at close on 120mph from Milan to Turin.’ It should be mentioned that FPL 660C had a lower compression engine in order for it to cope with the lower quality fuel on the continent. Back in the UK the government had decided to crack down on this type of high speed motoring. On 24 November 1965, the British government imposed a 70mph speed limit, initially for four months, but now in force for over 40 years. Still this did not effect ‘Jenks’ on the continent. 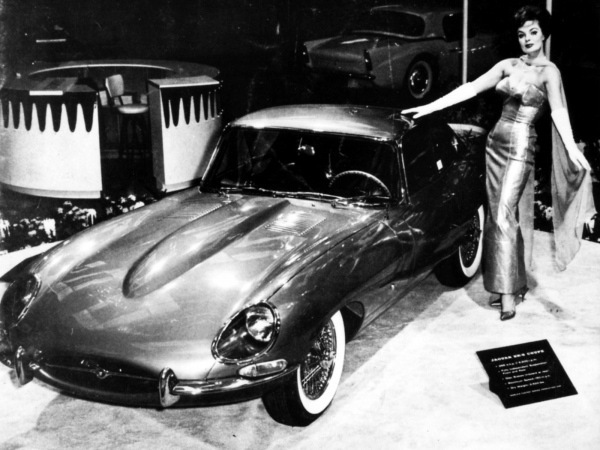 At the Geneva Motor show in March 1966, the delayed 2+2 E-type was announced. 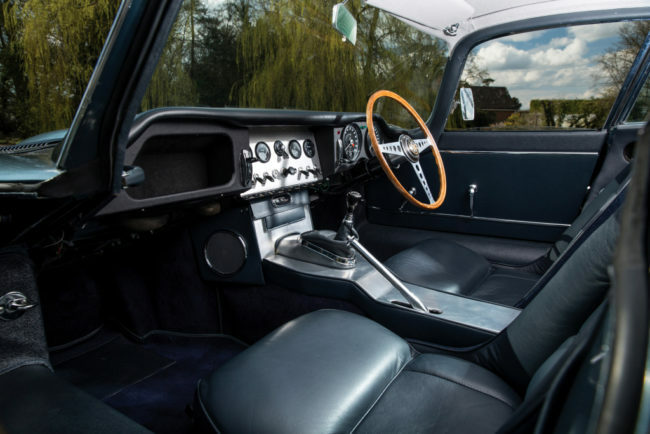 Right from the E-type’s earliest days, Sir William Lyons had demanded more room inside, and after a five-year gestation period, the finished article appeared. Using the internal codename of XJ8, the 2+2 was only available as a FHC and had its wheelbase lengthened by 9in to 8ft 9in. Weight was increased by 63.5kg. The 2+2 also featured a taller windscreen, longer doors and room in the back for two children. It was also available with a three speed Borg-Warner model 8 automatic transmission. The style was penned by Bob Blake. The 2+2 was the first alteration to the E-type’s form, and although stylistically it was less of a success, from a business point of view it made perfect sense. 1966 was the E-type’s best year yet, with some 6880 leaving the factory, with the new 2+2 proving to be the most popular model. 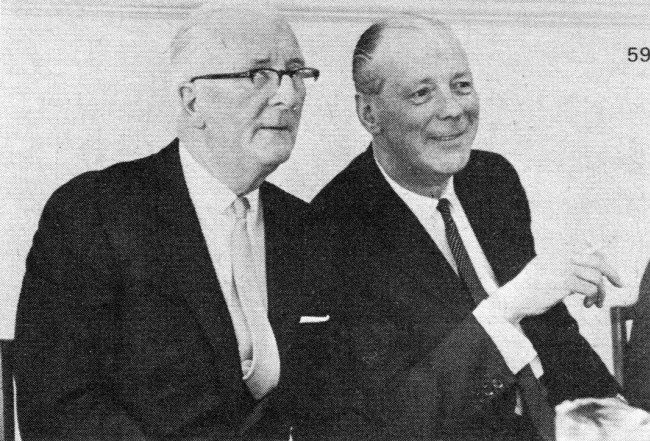 William Lyons (left) and George Harriman (right) announce the creation of British Motor Holdings in 1966. On 11 July 1966, Jaguar and the British Motor Corporation announced they were merging to form British Motor Holdings. Effectively a takeover of Jaguar, but allowing Sir William Lyons to maintain control of his company. With two brilliant engineering teams headed by William Heynes and Sir Alec Issigonis, how could they fail? The 2+2 E-type seemed to point the way to the future for the Jaguar sports car. Behind the scenes, Jaguar worked on its 60-degree modular V8 and V12 engines with commonised parts. These were intended for a new generation of cars including the XJ21 project, which was the planned E-type replacement. Work on The XJ21 project commenced around October 1966, and from the off, it was planned as a purpose built 2+2. Jaguar was also looking at developing a smaller sports car using the 2.5-litre Daimler V8, a 3-litre XK engine, or the in-development 3.5-litre V8. The company was certainly ambitious, but its financial resources made such goals unobtainable. The merger with BMC put paid to plans for a smaller Jaguar sports cars with the 3-litre MGC waiting in the wings. While this had been going on, a recession in the American car market had forced Jaguar to go on to a four day working week from September 1966. This affected all models except the E-type and 420/Daimler Sovereign, and proved costly for the company, as it wasn’t until early March 1967 that full time working was resumed. E-type production for 1967 had been squeezed down to 4989, well down on the comparable figure for 1966. It hadn’t helped that the Labour government had imposed a credit squeeze in July 1966, that dampened home sales and caused severe problems for BMC. All these factors contributed to BMH’s £7.5m loss in the first six months to January 1967, although Jaguar would have been in profit had it remained independent. At the same time these figures were released, April 1967, Sir Donald Stokes’ Leyland Motor Corporation was reporting record sales, and was in an acquisitive mood. This convinced the government that BMH should be merged with Leyland and by late July high level meetings were already taking place. 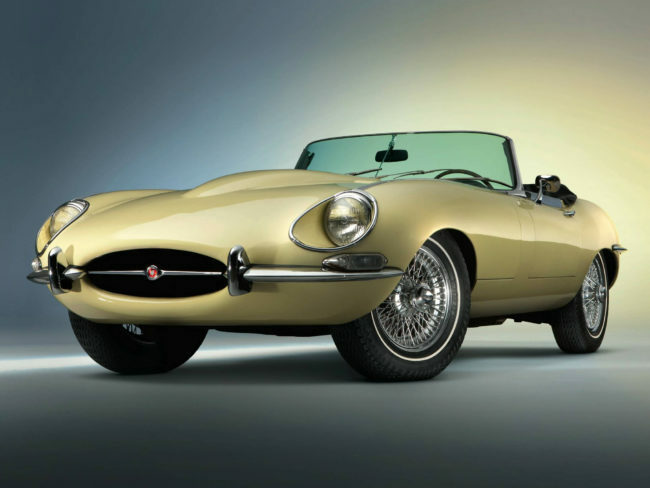 On 5 October, 1967 Jaguar announced a revised E-type, known retrospectively as the Series 1½. This was to meet impending US emissions legislation due to come into force on 1st January 1968, and this was after it had been delayed some four months by protests from British manufacturers. Jaguar spent £250,000 to enable the E-type to meet these new regulations. The most obvious revision to the Series 1½ was the removal of the perspex headlamp covers and the moving forward of the headlamps by 2.5in. This was another bastardisation of Malcolm Sayer’s design, although the Perspex covers did diffuse the headlights. According to Jaguar’s press release of the time, a total of 21 changes were made to the export cars to satisfy US regulations. In October 1967, Autocar magazine tested the latest revised E-type roadster. The car performed best with the hood up, with a top speed of 140mph. With the hood down, it could only manage 130mph. The 0-60mph time was 7.4seconds. On 17 January 1968, it was announced that BMH and Leyland were merging to form the British Leyland Motor Corporation, and by the Autumn Sir William Lyons became deputy Chairman. But 1968 was the year when the E-type ceased to be Browns Lane’s main attraction. There was a new kid on the block, and it was unveiled on 26th September. The Jaguar XJ6 was the culmination of all Jaguar Cars’ technical expertise all in one car. In terms of ride, handling, stability and comfort it was in a different league to what had gone before. Not only that, but it was able to carry four people in comfort and the manual version was available with overdrive, something the E-type never had, yet was available on cheaper sports cars such as the MGB and Triumph Spitfire. The acclaim for the saloon was instantaneous and a huge waiting list soon built up and Jaguar began phasing out its older saloons to free up production capacity to produce even more. It was also reported at the time that V8 and V12 engines were in the offing. At that year’s Earls Court motor show, the E-type Series 2, codenamed X12, was announced. There were numerous mechanical and styling changes, but no price increase – the biggest styling change, in the 2+2 FHC, was a redesigned windscreen, eliminating the earlier ‘high hat’ look with the angle of rake increased from 46 degrees to 53.5 degrees from the vertical – a change which also improved aerodynamic efficiency. The new E-types had sturdier bumpers, which wrapped around the entire nose and tail, giving better body protection. Beneath them were new, enlarged indicators, with bigger twin stop lights at the rear. For the first time, Jaguar offered bolt-on, pressed steel wheels as alternatives to the wire-spoke type, at extra cost. The headlamps were as the Series 1½. The front air intake had been re-shaped and enlarged, with a 68% aperture increase to give reserve capacity when air conditioning equipment was fitted. Also for the first time the E-type was offered with power-assisted rack-and-pinion steering as an optional extra. using the same system as on the new Jaguar XJ6 saloon. Air conditioning was now an option on American market cars and the car now featured a crossflow radiator with twin electric fans. Power on the US bound cars was now down to 245bhp SAE or 171bhp (net). The new American regulations demanded a reduction in hydrocarbon emissions, and this was an area where the six-cylinder XK engine did not perform well. So how did the Series 2 E-type perform? In November 1970, John Bolster tested a two-seat FHC for Autosport. Bolster still managed a respectable 142mph and a 0-60mph time of 7.2 seconds. Again the alterations seemed to pay off, with 9948 leaving Browns Lane in 1969, the peak year of production – and 8643 of these were exported. And this was despite a five-week strike at Leyland Vehicles in Lancashire, which supplied XK cylinder blocks which forced Jaguar to lay off workers. This was also the year Williams Heynes retired as Technical Director, to be succeeded by Walter Hassan. In 1969, the American car magazine Road & Track carried out a survey of 100 E-type owners, and came up with mixed results. By and large, Americans owners liked the car, but the survey revealed it did have a penchant for unreliability. The main faults were inaccurate instruments, overheating, oil leaks, dodgy electrics, failing clutches, water leaks and body parts falling off. There were complaints about lack of ventilation, lack of space, poor heating and de-misting. Such comments were not lost on senior Jaguar management as it drew up the specifications of the E-type’s eventual replacement. Several UK dealers had lobbied Jaguar to raise the price of the E-type by £100 to enable more attention to be devoted to eliminating annoying faults in the car – but all to no avail. By May 1970 it was reported that E-type production had slowed down to 250 per week. Perhaps with a huge waiting list for the more profitable XJ6 saloon led Jaguar to switch some E-type production capacity over to the newer car? Tragically in July 1970, Jaguar aerodynamicist Malcolm Sayer suffered a fatal heart attack. He was already working on the E-type’s successor which had mutated from the XJ21 into the larger XJ27/XJ-S. In a sense the Series 2 E-type was a better car than its predecessor – American buyers, in particular, demanded more comfort and air conditioning, even at the expense of performance and looks and the sales success of 1969/70 reflected this. Jaguar E-type: limited for the future? But engineering this into the aging E-type was proving problematical as Jaguar Deputy Chairman FRW Lofty England told author Philip Porter. ‘People don’t realise how operating conditions have changed since 1961. Traffic is now so appalling and you spend half your time sitting in a traffic jam. If you’re sitting in traffic, you need some room to move and you need a proper, decent air conditioning system. The E-type hadn’t got it. Although it had originally planned to replace the E-type with the XJ21 (above), finances dictated that that Jaguar examined the possibility of using a shortened XJ saloon floorpan and the forthcoming V12 engine. This made perfect sense as it enabled a degree of rationalisation to take place and produce a roomier car with space for all the equipment consumers demanded. Also, Sir William Lyons wanted a more refined GT car which could retail at a higher price and generate more profit for the company. This became project XJ27 which evolved into the XJ-S. A direct E-type replacement would have to wait until the funds became available to develop one. As related earlier, Jaguar was working on a modular 60-degree V8/V12 engine, although the V8 was to prove a blind alley. 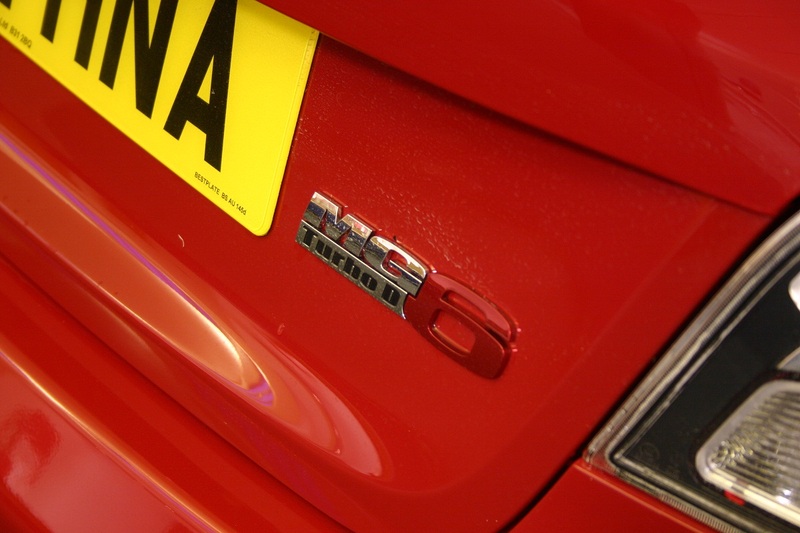 For more information on the V8/V12 saga, please look at the XJ6/12 development story. Originally the V12 was intended for the XJ saloon, but in 1968 Technical Director William Heynes pushed for the V12 engine to be used in the E-type. The shoehorning of the V12 into the E-type became project XJ25. The first prototype was completed in 1969 and extensive testing followed with 87 production cars being completed by the end of 1970. The XJ25 was launched in March 1971 as the Series 3 Jaguar E-type and became the first car to use the new 5343cc V12 engine. The V12 was fitted with four Zenith Stromberg 175CD carburettors and was rated at 314bhp (SAE) at 5850 rpm, but by now Jaguar was admitting it was in reality 272bhp DIN. Transmission was the Jaguar four-speed manual or the optional Borg-Warner 12J three-speed automatic. At launch, Jaguar stated that the XK engined E-type would remain available in Series 3 form, but in reality only three were manufactured. Visually the Series 3 E-type was recognisable by its enlarged air intake which was fitted with a chrome grille, similar in style to that fitted to the XJ6 saloon. Pressed steel wheels with chrome hubcaps were standard, and wire wheels were now an optional extra. The wheels were now 6in wide, an inch more than before, which resulted in the car having flared wheelarches. The Series 3 also featured a wider track, power steering as standard, and more powerful brakes. The decision was made to standardise the 8ft 9in wheelbase of the 2+2, which meant the 2-seater FHC was no longer available. So how did it perform out on the road? 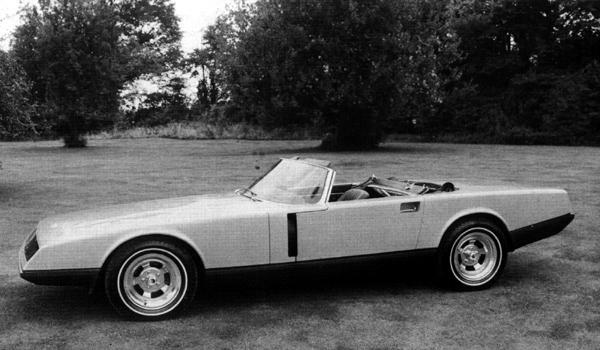 Motor magazine tested a Series 3 Roadster in November 1971 and achieved a maximum speed of 146mph, 3mph down on 77 RW a decade before. If nothing else, it showed how much less aerodynamic the E-type had become. What was more impressive was the 0-60mph time, now down to 6.4seconds. Autocar tested the FHC and came away with 142mph and 6.8seconds. At £3123 for the Roadster and £3,369 for the FHC, the Series 3 was still great value for money. It was cheaper than the £3671 Porsche 911, which could only manage 125mph. If you still wanted 150mph, you could opt for the Ferrari 365GT 2+2, but it would cost £9141. By now there were even faster cars on the market, such as the Lamborghini Miura, which for £10,860 could top 170mph. The 1970s would be the decade of the supercar, and although the E-type was perhaps the progenitor of these, it was a game Jaguar could no longer afford to indulge in. 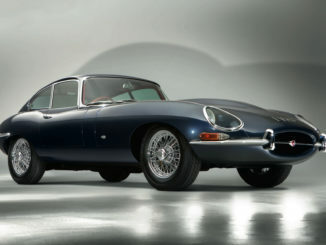 In 1971, Jaguar built 35 XK E-types and 3746 V12s, which was down on the previous few years – and was perhaps an indication that the car was losing its sales appeal. The following year began badly for Jaguar. A two-week strike by 100 engine assemblers crippled car production. Then, in March Sir William Lyons retired, to be replaced by Lofty England. In June 1972, a ten-week strike over pay and the proposed abolition of piecework at Browns Lane brought the assembly lines to a halt. Pickets prevented the despatch of spares to dealerships. In the midst of all this, on 11 July, the Jaguar XJ12 saloon was announced – the car the V12 engine was intended for – although the strike crippled its introduction. The longest strike in the history of Jaguar cars ended on 5th September after ten weeks and four days. It cost the company some £21m worth of cars and ruined the launch of the XJ12. Each of the 2000 strikers was estimated to have lost between £300 and £400 in wages. Many of the strikers complained that they rarely worked a full week as they were often sent home early due to a shortage of components from the ex-Daimler Radford factory and external suppliers. The settlement of the dispute led to the introduction of measured day work at Browns Lane and production of the XJ12 went full steam ahead to meet demand. 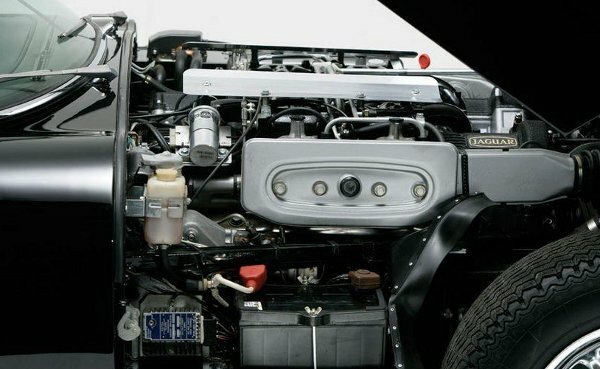 The automatic transmission XJ12 with a maximum speed of 135.7mph was little slower than the FHC Series 3 E-type, which showed how much chassis development had progressed since 1961. In 1972 E-type production amounted to some 3705 cars, but the assembly lines had been at a standstill for around thirteen weeks during the year due to industrial disputes. Also during the year Jaguar Technical Director Walter Hassan retired to be replaced by Bob Knight. On 6 September 1973, Geoffrey Robinson, who had been out in Italy running British Leyland’s Innocenti operation, was appointed Jaguar Managing Director working alongside Lofty England. Later in the month, a strike at power steering supplier Adwest brought the production lines to a halt, and in October the Arab-Israeli Yom Kippur war broke out. In protest at the West’s support for Israel the OPEC nations cut back oil production and raised prices with a cataclysmic effect on the world economy. In the same month, the Jaguar E-type FHC ceased production, the reason being that from 1974 all coupes sold in the USA had to be fitted with an internal roll-over bar. Jaguar then boosted roadster production. In December, Geoffrey Robinson announced an ambitious plan to double Jaguar production by 1975. A total of 4686 E-types left Browns Lane in 1973, which to be fair was quite good and the best since 1969. For parent company British Leyland, 1973 was a dreadful year in which it was plagued by strikes which prevented it from exploiting an expanding car market. On New Year’s Day 1974, the three day week came into force lasting until March. The Three-Day Week was one of several measures introduced in the United Kingdom by the Conservative Government 1970-1974 to conserve electricity, the production of which was severely limited due to industrial action by coal miners. The effect was that commercial users of electricity would be limited to three specified consecutive days’ consumption each week and prohibited from working longer hours on those days. 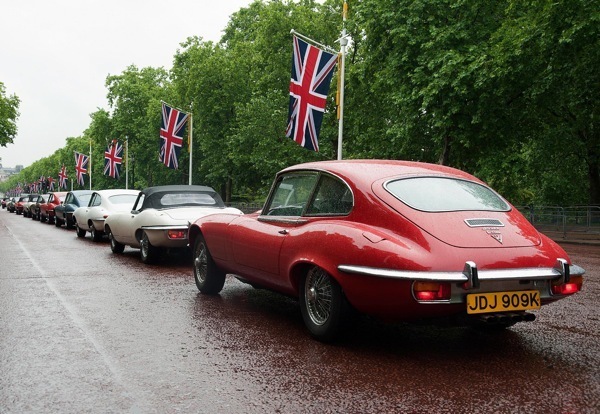 Analysing the E-type production figures, it appears during the three-day week Jaguar managed to produce around 730 cars despite the restrictions, suggesting the implications of the steep oil price rises had not hit home. Lofty England retired from Jaguar at the end of January 1974, citing friction with Lord Stokes nominee Geoffrey Robinson, who replaced him as chairman. As for the E-type, time was running out. All cars exported to the USA from 1974 had to have ungainly rubber bumper overriders which added weight and further distorted the cars appearance. And to make matters worse there were more restrictive American safety regulations on the way for 1976. Sadly for the E-type, its boot mounted petrol tank could not meet the mandatory 30mph rearward barrier crash test due to come in force. Demand in the USA had now virtually evaporated and because Jaguar had not cut back on production, there were many unsold cars at dealerships. At least two Series 3 E-types were fitted with a five speed gearbox designed by Trevor Commins, working under Harry Mundy. One was fitted to Lofty England’s FHC which was written off by a Jaguar apprentice around 1975. 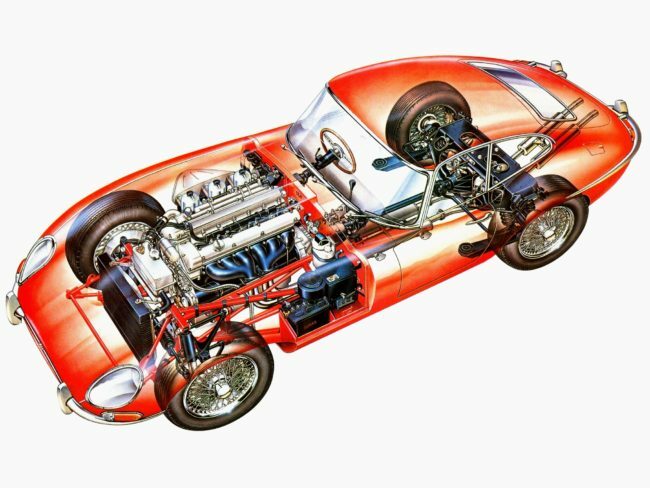 A second gearbox was fitted in 1973 to the seventh production V12 E-type owned by Major General WM Broomhall, when his car had completed 70,000 miles. 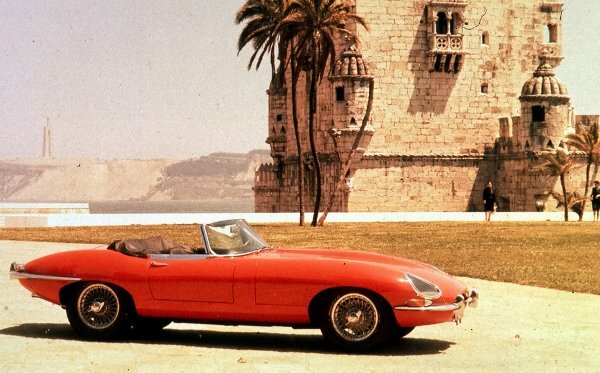 The E-type left an enduring legacy which enabled people to forget its faults. In September 1975 the Jaguar XJ-S was launched. Criticised for its styling, initially unreliable and badly built to the point that by 1980 it faced extinction, the XJ-S suffered in comparison with its predecessor until it came good in the late 1980s. In fact the XJ-S was more aerodynamic than the Series 3, thanks to the work of Malcolm Sayer, and was designed to meet US legislation, which the E-type could no longer conform to. The E-type had been magnificent in its 1960s heyday, but in the 1970s world of speed restrictions, motorists wanted more comfort, and sadly the E-type had to go. Still, starry-eyed nostalgia for the E-type continued to play its course, and by the time of its 50th anniversary in 2011, Jaguar had finally decided to launch a car that continued this car’s great name. 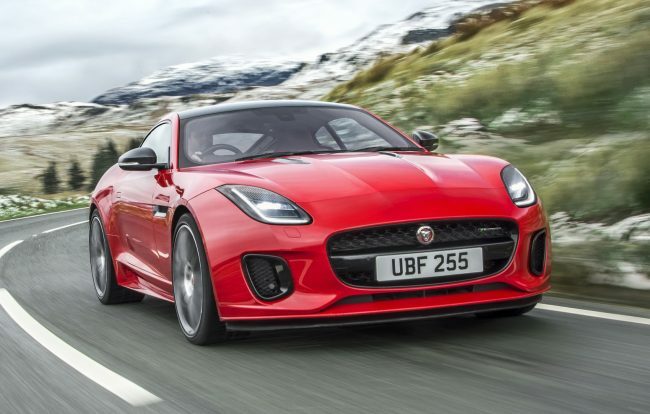 The Jaguar F-Type was reportedly signed off within days of Ratan Tata taking control of the Coventry-based company, and continues as the company’s flagship sports car as it sets sail towards an electrified future in the 2020s.